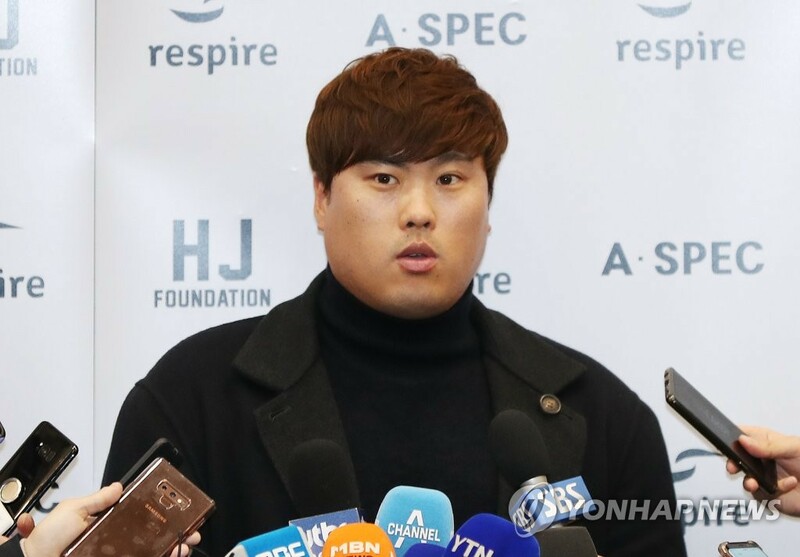 INCHEON, Nov. 20 (Yonhap) — By accepting the Los Angeles Dodgers’ one-year qualifying offer last week instead of testing the open market, South Korean pitcher Ryu Hyun-jin rolled the dice and gambled that he will have a strong 2019 season and his value will rise even higher next winter. And Ryu said Tuesday he was confident things will work out just fine. Ryu’s six-year, US$36 million deal with the Dodgers expired after the season. And in Major League Baseball (MLB), teams can present their own free agent with a qualifying offer, worth the mean salary of the top 125 players. This year, the offer came in at $17.9 million. Since the system was introduced in 2012, only six of the 80 players receiving the offer have accepted it. Of the seven who received an offer this year, Ryu was the only player to take it. In the regular season, Ryu went 7-3 with a 1.97 ERA in 15 starts, while striking out 89 in 82 1/3 innings. It was a solid bounceback season after a subpar three-year stretch that saw him undergo shoulder and elbow operations. Ryu also made the Dodgers’ postseason rotation and became the first South Korean to start a World Series game. When the Dodgers reached the World Series in 2017, Ryu wasn’t on the postseason roster. But he was also sidelined for three months, from May to August, with a groin injury. His last healthy season came in his rookie year in 2013. In addition to his shoulder and elbow woes, Ryu has been on the disabled list with hip injuries in the past. Ryu said his goal next year is to remain in the Dodgers’ starting rotation and to avoid going on the disabled list again. Ryu was impressive in his first postseason start last month, throwing seven shutout innings against the Atlanta Braves for the Dodgers’ 6-0 victory in Game 1 of the National League Division Series (NLDS). But he followed that with a couple of mediocre starts in the NL Championship Series (NLCS) against the Milwaukee Brewers, allowing seven earned runs in 7 1/3 innings combined. Ryu then made history by becoming the first South Korean to start a World Series game when he went up against the Boston Red Sox at Fenway Park in Game 2. He was the losing pitcher in the Dodgers’ 4-2 defeat after getting charged with four earned runs in 4 2/3 innings. The Dodgers bowed out in five games and Ryu didn’t pitch again.